Notice the Halo around Mary (especially her head). 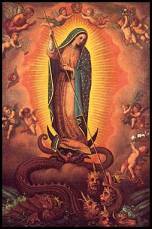 The is an idolatrous practice of the Catholics which symbolizes deity (that she is equal with God). The Babylonians practiced the same idolatrous worship to the Queen of Heaven. 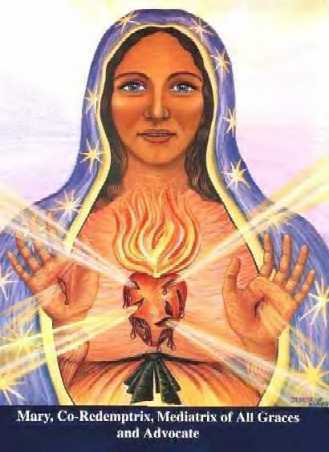 Mary is NOT deity, she was a normal every-day woman. Yes friend, Satan is definitely working in the Vatican and in Catholic organizations all across the world. Though most Catholics will deny worshipping Mary, the evidence says something very different! 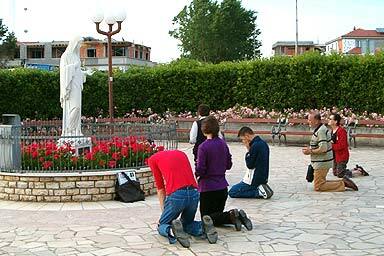 They bow down and literally pray in the name of "Mother Mary" to a graven statue of Mary. This is sinful idolatry! They are lying through their teeth. God makes CLEAR in His Word that He will NOT share His glory with another (that includes Mary). How could anyone be so foolish to actually bow down in prayer to a statue of Mary, yet at the same time deny that they are worshipping her? Talk about crazy! God clearly command us in the first of the ten commandments NOT to make unto ourselves ANY graven images. 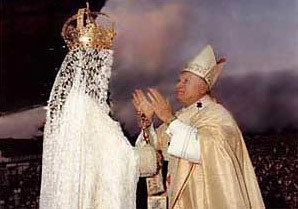 Above: Roman Catholics sinfully BOWING in idolatry to a statue of Mary. Ok, so then why does every Catholic BOW DOWN before a statue of Mary in their worship places? I'll tell you why... because they are practicing FALSE religion totally void of the truth of God. You can argue whether or not you are worshipping Mary as your bowing down to her; but one thing is for certain, God has commanded us in Exodus 20:5 NOT TO BOW DOWN to her. Even if your not worshipping Mary, you ARE SINNING if you bow down to her because the Bible strictly forbids it in Exodus 20:5! As I write, millions of people all around the world are bowing down to Mary in violation of God's Word. 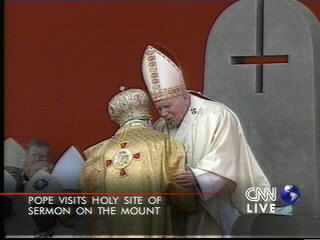 Yes, Satanism is in the Vatican! The Vatican CANNOT Forgive Sin! Why is Catholicism So Popular? Image of Divine Mercy EXPOSED! Facing Uncertain Death, Troops Line up for Baptism? Can a Christian Be a Catholic? Catholicism is a lie of the Devil. If I didn't sincerely care about people, then I wouldn't take the time to WARN you. 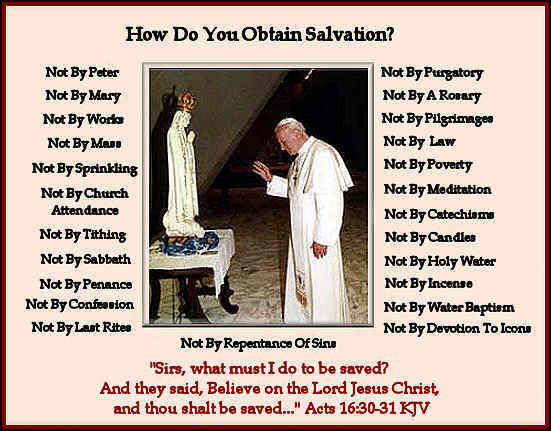 The Catholic religion is all a bunch of Satanic lies based upon traditions and ridiculous manipulations of the Word of God. I plead with you as a friend, obey the Bible by turning to the Lord Jesus Christ in faith and forsaking the Mother of Harlots. The Great Whore of the Catholic Church will take you to hell with them if you're foolish enough to follow them. Don't do it. Salvation is NOT found in a religion, but in a Person—the Lord Jesus Christ! You need Christianity friend, NOT churchianity. Will the Catholics Ever Make Up Their Minds?